After shows end in December and until they start up again in May, I take time to re-energize, experiment, and just play in the studio. 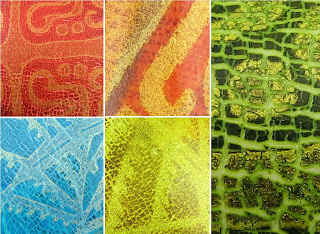 For the past year, I've been fiddling around with a new surface technique on polymer using a combination of alcohol inks and silkscreened acrylics. The past couple of months I've refined it so that I can more or less duplicate the results. The technique is not an exact science, though. For an organized and analytical person, it's surprising that my work is almost 100% reactive. I simply go where it takes me and then have no idea how I got there. Great for one of a kind pieces, but not so efficient for production work! 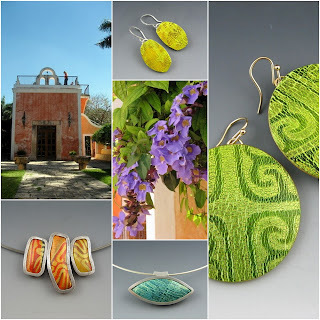 My Maya Collection is inspired by the colors of the Yucatan: the azure blues of the ocean, the yellow/greens of the lush vegetation, the desaturated reds and oranges of old hacienda walls and the texture of Mayan artifacts . And perfect timing - vibrant colors are hot for Spring! So pretty Betsy - I love that shade of green! super cool Betsy - I especially love the blue dot leaf earrings! Love the new designs Betsy!! I think I learned something new about you as well - that you were born in Mexico... where did I read that...hmmmm - very cool! !